Olympic hopeful, Chase Graham is a student at GWC who has been competing nationally and internationally in Taekwando. 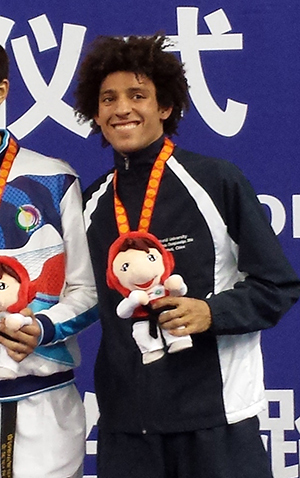 He won a Bronze Medal representing GWC recently at an international competition in Berkeley and also China. The US National Collegiate Taekwondo Team earned one gold and five bronze medals at the 13th World University Taekwondo Championship (WUTC) in Hohhot, China. The championship was held over seven days, from June 8-14, and was contested by collegiate athletes from over 30 countries. The six medals earned in Hohhot were the US collegiate team’s best result since 2004. On June 13, Chase Graham (-63kg, Golden West College) earned a bronze medal, winning 13-6 over Russia, and again 6-5 in the quarters to advance over Germany. In the semifinals, he lost a very close match to Egypt that was sent to overtime on a last-second kyongo 7-7, where he lost (0-1) to earn the bronze. Congratulations Chase! Your are someone to watch!! Since 1966 GWC Athletics have won 84 State Championships - more than any other California Community College.